Agricola voor holbewoners. Deze opzichzelfstaande editie van Agricola speelt zich in de prehistorie af. Je hakt grotten uit en meubileert ze, terwijl je buiten bomen omhakt en dieren houdt. Ondertussen verzamel je allerlei grondstoffen en edelstenen om je acties te kunnen bekostigen. Kies elke beurt een actie met jouw holbewoners en ontwikkel je grotten tot luxe woonruimte en maak je tuin zelfvoorzienend. Verzamel robijnen om speciale acties te kunnen uitvoeren en houd ezels in de grotten Honden houden je kudde schapen onder controle. Heb jij aan het einde van het spel de meest waardevolle grot?! Agricola-spelers zullen bekende en nieuwe spelmechanismen tegenkomen, maar vooral de beleving van Caverna is wezenlijk anders. 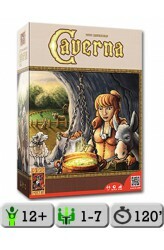 Omdat er veel minder speelkaarten in het spel zitte..
Caverna: The Forgotten Folk — Caverna: Vergessene Völker in German — originated as a fan project on BoardGameGeek, and Caverna publisher Lookout Games has decided to work with the designer to develop this material and release it as an official expansion. 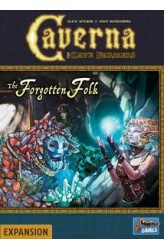 Forgotten Folk consists of eight different species or race packs such as elves, dark elves, and trolls, and now each player in Caverna can be one of these species instead of only the dwarves in the base game. Each species has special advantages and disadvantages, and some species introduce new resources into the game. Each species has four unique rooms, and they replace rooms in the base game, which allows other players to gain the powers of these species. https://youtu.be/OnHtM5ct2No ..
Once upon a time a witch lived alone in her house in the depths of the forest. Her favorite hobby was baking yummy gingerbread; in fact, she loved gingerbread so much that she built her entire house out of it. Unfortunately, she wasn't the only one who loved it! 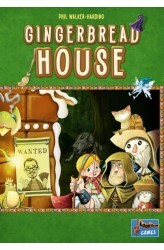 Rude fairy tale characters passing by were eating away her walls, windows, and doors! One day, the witch decided that she'd had enough of them all helping themselves and, paying attention to which types of gingerbread these greedy intruders liked the most, she came up with an idea on how to get rid of them once and for all... In Gingerbread House, you place domino-like tiles in a 3 by 3 grid, covering symbols that provide you with four different types of gingerbread and special actions. Tiles may also be placed on exist..
One cannot win the struggle for dominance over the island without powerful allies. As every wise king knows, power is not measured in strength and gold alone. Having the support of the spiritual leaders of the country can be the decisive factor. Win the druids over to your cause, and harness the power of their mystical sacred sites for your benefit! 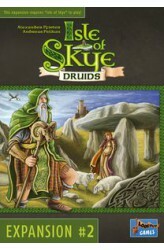 Isle of Skye: Druids, the second expansion for Isle of Skye, can be played with the base game on its own or with the base game and the Journeyman expansion. This expansion splits the buying phase (phase 4) into two buying sessions. With your first purchase, you can buy a tile from your fellow players in the usual manner. For your second purchase, you can buy a tile from the dolmen board. 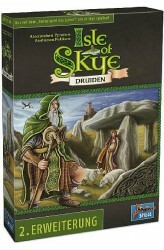 These "druid" tiles are normal landscap..
Isle of Skye is one of the most beautiful places in the world, with soft sand beaches, gently sloping hills, and impressive mountains. The landscape of Isle of Skye is breathtaking and fascinates everyone. 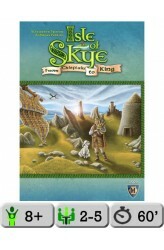 In the tile-laying game Isle of Skye: From Chieftain to King, 2-5 players are chieftains of famous clans and want to build their little kingdoms to score as many points as possible — but in each game only four of the sixteen scoring cards will be scored. Thanks to the scoring cards, each game is different and leads to different tactics and strategies, but having enough money is useful no matter what else is going on. Managing that money can be tricky, though. Each turn, each player places two area tiles in front of them and sets the selling price for the tiles. Setting a high .. Becoming a king is hard, but being a king is even harder. You need warriors to protect your kingdom, merchants to keep your treasury liquid and heralds which proclaim your popularity across the kingdom. Luckily, your best mate has agreed to take over the hard graft so that you concentrate becoming a glory chieftain. 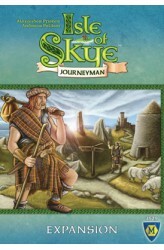 Isle of Skye: Journeyman, the first big expansion to Isle of Skye, contains new personal player boards indicating your progress in terms of strength, prosperity and popularity. As each progress step has requirements to be met, the personal player boards affect tile selling and placement. However, in order to claim the next level of development and gain potential rewards, it’s not sufficient to place the corresponding tiles only. A new pawn (the journeyman) needs to ..
Murano the game is set in Murano, a small group of seven islands near Venice that's well-known by tourists for its glassmaking. As in Venice, the islands of Murano are separated by canals, so gondolas and transportation are at the heart of this game. 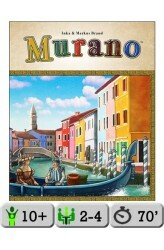 The game board depicts the islands of Murano, with the islands being divided up into building sites and walkways. Surrounding the islands is a series of action spaces, with gondolas being present in some number of them at the start of play. On a turn, you move one of the gondolas in the direction of play to an empty space, then take the action shown there. You can't pass another gondola while moving or land in an occupied space, but for a coin you can move a gondola that's in front of the gondola you want to move, and you can pay ..
NEOM is a modern city-building game featuring simultaneous drafting and tile placement that takes inspiration from games such as 7 Wonders, Carcassonne, and Sim City. Players compete to build the most impressive city utilizing a tree of 17 different goods (from three different tiers) that can each be unlocked, allowing the placement of increasingly powerful tiles as the game progresses. Tiles also feature roads which must be connected without being rotated, meaning that players must always plan their city layout with an eye to the future. At the start of each game, players draft cornerstones — powerful, unique tiles that heavily change what is most valuable from game to game. 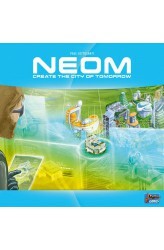 NEOM has been in development for seven years and the rules and tile set have be.. Riots are spreading in the capital Longsdale as well as rumors that there could soon be a war. The king needs your help, and your decisions might even be able to turn fate in a new direction... Oh My Goods! 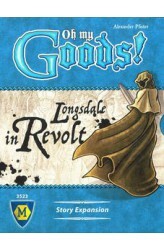 : Longsdale in Revolt, an expansion for Oh My Goods!, consists of five chapters that together tell a single story. The length of the game is now not fixed, but depends on the current chapter, which has an event deck that will be compiled differently each time you play. The expansion also includes four character cards, 34 new buildings (in seven types), 22 event cards (in both German and English), and 14 chapter cards (ditto). https://youtu.be/bwGi4FmOMIc .. 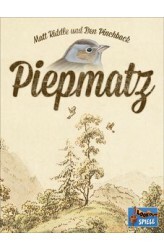 In Piepmatz, you skillfully play bird cards from your hand to collect seeds and birds at the bird feeder. Seeds and mated pairs of birds in your collection are worth points. Single birds score only if you have the most of their species. The course of play is the same for all numbers of players. On a turn, you go through these three phases in order: Play a card — Select a bird card from your hand and place it face up at a perch of your choice. Resolve effects — Compare the birds on the ground with the bird at the perch. Take a seed card or add a bird to your collection. Move a bird to the feeder. Draw new cards — Replenish your hand. The game end is triggered when you are supposed to draw a card from an empty feeder deck. 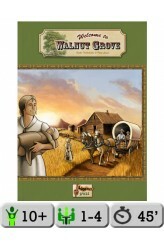 Play continues until all players have h..
Walnut Grove is a cross between jigsaw puzzles and worker placement, with the players as farmers who find their plots merging into a single landscape as time passes and their holdings grow. Come fall they must head to the city with their goods as winter will soon return. Walnut Grove could be described as a light mashup between Carcassonne and Agricola. The goal of the game is to develop your own ranch. The better the ranch, the more points you will score at the end of the game. Players can improve their ranch during the game by adding new land tiles to it, hiring more workers, building improvements, etc The game play is divided into eight years, and each year is divided into Spring, Summer, Fall and Winter phases. During Spring, players add land tiles to their ranch. During S..